I write to you today from sunny, beautiful Australia. I’m in the Gold Coast (Surfers Paradise) for the finale for The Ultimate Fighter: The Smashes on Saturday. I flew down here straight from Seattle following UFC on FOX 5 and went straight to work, so I haven’t had much time to work on a proper blog post. I’ll spare you a long-winded writeup and just get to the good stuff. UFC on FOX 5 featured a great night of fights, which capped a fantastic week that I was able to share with my wife in Seattle. I covered the fights alongside longtime Getty staff photographer Ezra Shaw. Here’s my favorite shot from the night. And here’s my full slideshow from the night. Sunday morning, I left Seattle destined for Gold Coast, Australia. My itinerary saw me layover in San Francisco for about 5 hours, followed by a 12-hour flight to Auckland, New Zealand and another 3 hour layover there. 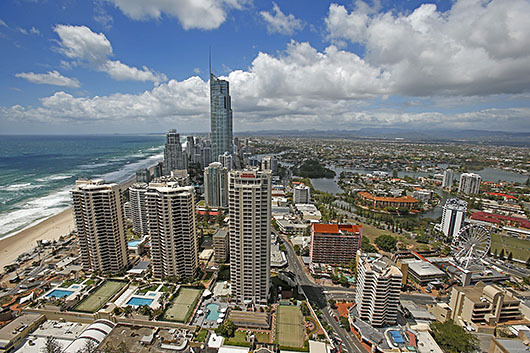 I finally arrived in Gold Coast mid-morning Tuesday. Upon arriving at the hotel in Surfers Paradise, I was presented with some of the best working conditions a man could ask for. While I haven’t had much time to venture out and see any sights, just the fact that I can wake up and open my blinds every morning to this view makes the workday seem so much easier. On Wednesday, I spent the day shooting portraits of various fighters on the card. Nothing too exciting, though it was nice to see all the guys again who I worked with at the beginning of filming for TUF: The Smashes. Everyone is in great shape and excited to put on a great fight. Thursday saw us drive out to Boonchu Muay Thai for the open workouts. The gym is owned by legendary Aussie fighter John Wayne Parr. It was a pleasant surprise when the man himself greeted us upon arrival and welcomed us into his gym. It’s a very small gym in a warehouse complex, but it worked out great. 8 fighters from the card worked out in some form or another. Some only shadow boxing, others a little more intense. Here is a slideshow of shots from the workouts. And today saw the fighters all hit the scale for the official weigh in ahead of tomorrow’s fights. All fighters made weigh on their first try and there were no big surprises. 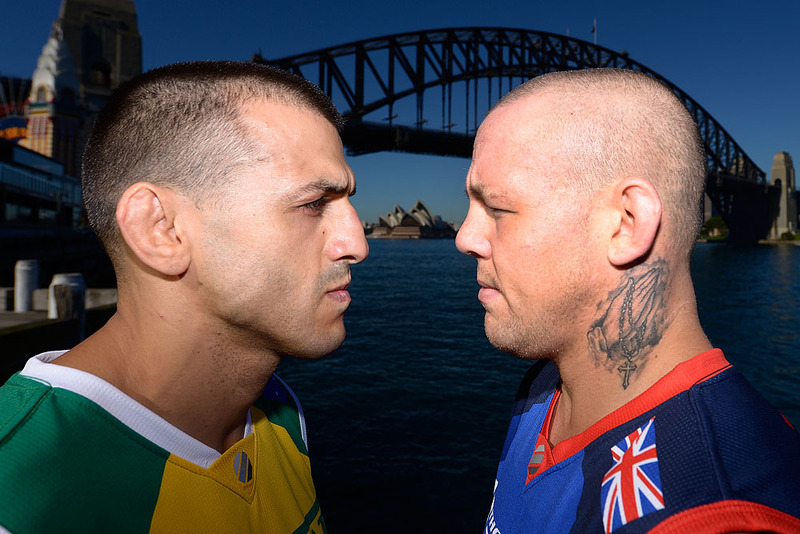 TUF Smashes Coaches Ross Pearson and George Sotiropoulos capped off the weigh in with a heated staredown. Below is the slideshow of images from the weigh in. Hello everyone. It’s been a long while since I’ve posted an update here. Work has been busy and life in general has been even more busy. Last month, I spent three weeks shooting a number of assignments with the Nikon D800. I’ve been thinking of switching over to the “dark side” for quite some time, so I thought I’d give it a try and see whether or not it was going to be a viable option. Due to the Olympics, I had to source the gear from a rental house that I use all the time – borrowlenses.com. They have virtually everything a photographer could ever want, their customer service is top notch, and their prices are very competitive. Given the nature of my assignments, and the fact that it just wasn’t available for the time I needed, I was not able to get a D4 to try out. I ended up getting a D800 with the battery grip, the 14-24mm f/2.8G AF-S ED lens, the 85mm f/1.4G AF-S lens, and the 24-70mm f/2.8G AF-S ED. The majority of my assignments were to be portraits, so that’s why I ultimately chose the D800 and those particular lenses. I attempted to rig the camera as an overhead remote at UFC 148, but due to an unknown person messing with the camera after it was rigged and secured, the images turned out a complete waste. 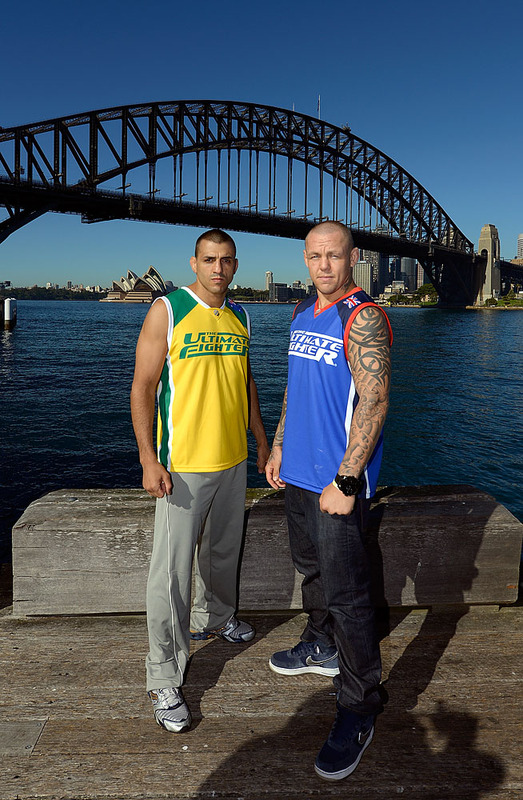 Next, it was off to Australia to begin filming for The Ultimate Fighter: The Smashes. I had three separate portrait shoots while I was down there to cover all the fighters, coaches, and the new Octagon Girls. 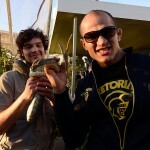 I also spent a few hours following Junior dos Santos around at Wildlife Sydney. I also used the camera to shoot some beauty shots of the empty gym and house before filming officially began on the show, as well as some behind-the-scenes stuff on set during filming. All the shoots turned out great, and I’m more than happy with the results. Being a Canon guy for going on 20 years, it did take a little getting used to for me to learn the different button positions, functions, and operations of the Nikon system. Though, I really expected to have more trouble with it than I did. It really felt comfortable in my hands, and I learned quickly to operate everything I needed to use efficiently. The D800 is a great camera, and I believe it is leaps and bounds ahead of it’s Canon competitor – the 5D Mark III. Keep in mind though, I’m evaluating this purely as a still camera. I have never once used the video function on any of my DSLR cameras, as I have no need for that. So don’t send me hate mail about how deluded I am because the 5D video is so great. That may be the case, but it means absolutely nothing to me for what I need this camera for. The D800, in my opinion, has a far superior autofocus system. Couple that with the ridiculously huge image size (36 MP), and I consider this to be a winner and well worth the price tag. Furthermore, comparing it side-by-side to the 5D Mark III, the D800 just looks and feels much more like a professional camera. I would love to post a lot of examples of what I shot with it, but due to the delayed airing of the TV show, I cannot post anything from it. 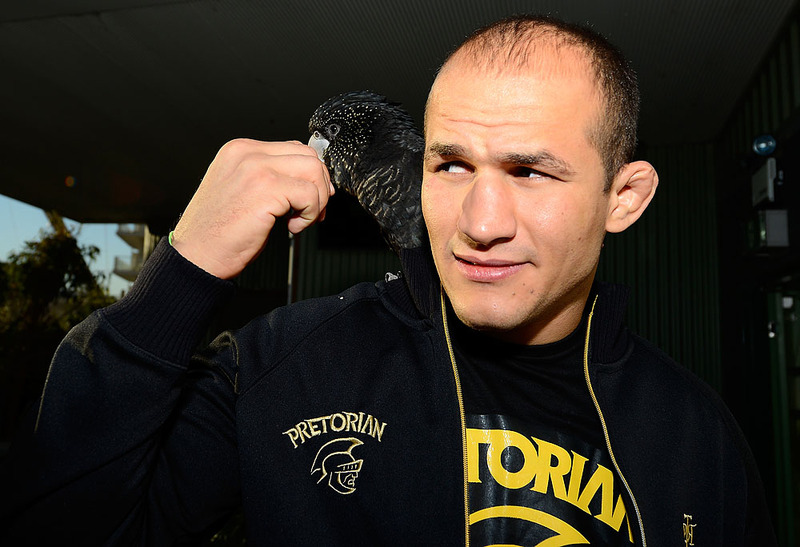 You can find some samples from a shoot with the coaches and the Junior dos Santos shoot in the previous posting here. Hello everyone. Sorry for the lack of updates since I’ve been down in Australia. I’ve been working pretty much non-stop, as usual. The weather down here is beautiful. It’s winter here, so the highs have been in the 70’s and lows in the 50’s. We’ve been blessed with clear skies most days, especially the days when we’ve been scheduled to shoot outdoors. As you may or may not know, I’ve been demoing the Nikon D800 and a handful of lenses on this trip. I’ll try to write a more thorough review at some point in the near future, but for now, let me just say that I’m very happy with the results and absolutely love the D800 and the Nikon system in general. As a Canon user for pretty much my entire life, it’s very refreshing to change things up. The 36 megapixel sensor is simply amazing, and I think I’ve found a new favorite lens in the 14-24mm. I can’t share a lot of what I’ve been shooting as we’re filming The Ultimate Fighter: The Smashes. The show will begin airing in Australia in September. At that point, most of what I’m shooting will see the light of day. For now, I’d like to share a few images of some of the other stuff outside of the secret stuff for the show. 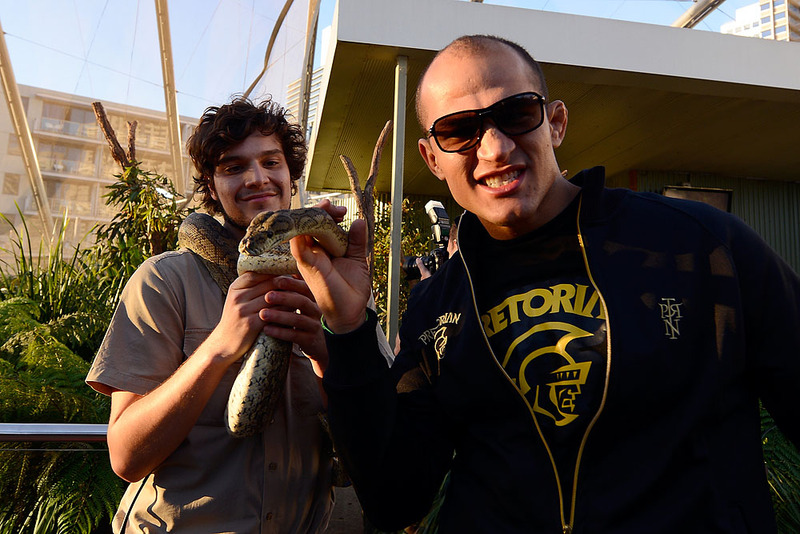 The first couple images are from a media call we did with coaches Ross Pearson and George Sotiropoulos, and the last few were a trip we took to Wildlife Sydney with Junior dos Santos. All of these were shot with the previously mentioned 14-24mm lens, and a Nikon SB-910 speedlight. Today, UFC hosted an open workout session for members of the media featuring fighters from this Saturday’s live season finale of The Ultimate Fighter. I covered the action at the UFC Training Center for Getty Images and UFC. This was my second shoot using my FourSquare units, made by Paul Peregrine’s company Lightware. The gym was a much more ideal location to feature this lighting setup, and I’m very happy with the results. I loaded each unit with two 580EX II speedlites, each running at half power. I can’t wait until I can afford to add four more speedlites to be able to fully load each FourSquare, or even double up and make an “EightSquare” like Dave Black did for his surfing shoot. The lights were positioned opposite each other, about 16 feet from the center of the Octagon and about 15 feet high, angled down. I zoomed all the flash heads to 105mm, which created a fairly narrow strip of light that ran across the Octagon. I’d say the section of best illumination was about 8 feet wide in total. Anywhere outside that section, I had to adjust my settings to accommodate the fall off. For most of the shots, I positioned myself centered between the lights, about 10 feet in front of their plane, so that the light was shooting directly across my frame. I moved around a little and just followed the fighters wherever they went, so some shots the light wraps around more than others. I put each FourSquare on a separate zone so that I could control their power independently, or turn one off completely using the PocketWizard AC3 zone controller, which by the way is an awesome product for a fraction of the cost of the Canon controller. For the most part, I kept my camera settings at ISO 400, 1/1600, f2.8. Ambient light was pretty low in the gym, so I decided not to try to incorporate it and just used the FourSquare as my main light source. The backgrounds were also crowded with people and gear at times, so all the more reason to not expose for the ambient. I think the only thing I wish could have gone differently was to have the fighters do more intense workouts. Most only did short shadow boxing routines. Of course, it’s the day before their weigh in, so it’s understandable that they don’t want to go crazy hitting pads or anything. I’m hoping to get into some training camps with these units soon and then I think they will really make some great pictures. I’d love to hear your opinions and answer any questions you might have. Post a comment here or email me through my website. Here is a slide show of shots from the shoot. Hello again everyone. It’s been a couple hectic weeks since we got back from Australia and I haven’t had the time to post a proper update. 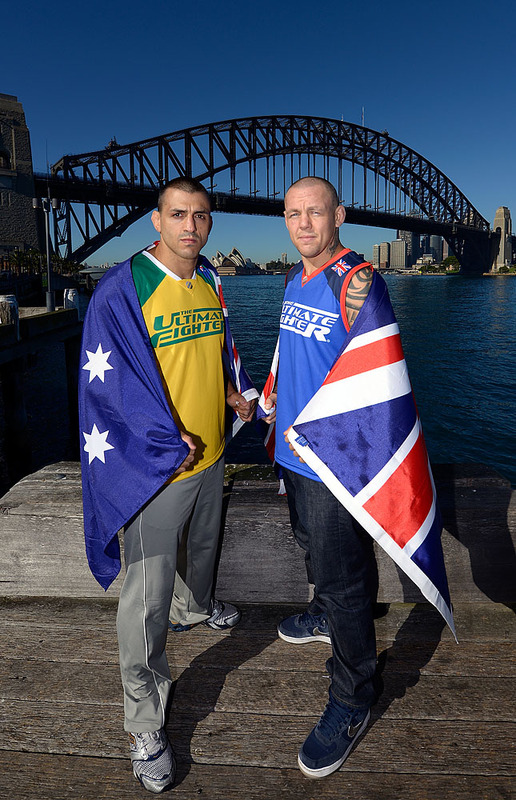 Less than twenty four hours after arriving back in Vegas from Sydney, the new season of The Ultimate Fighter debuted with the first ever live episode featuring sixteen elimination fights. Jet-lagged and sick, I hauled my gear over to the TUF Gym to shoot the fights. Luckily, I was splitting duty with my buddy Al Powers, who scored some great shots of his own and really helped me out. Also working in our favor was the fact that all the fights would only be one round instead of the normal two. For the most part, this seemed to make the fighters come out looking to finish and resulted in a much more exciting collection of bouts. 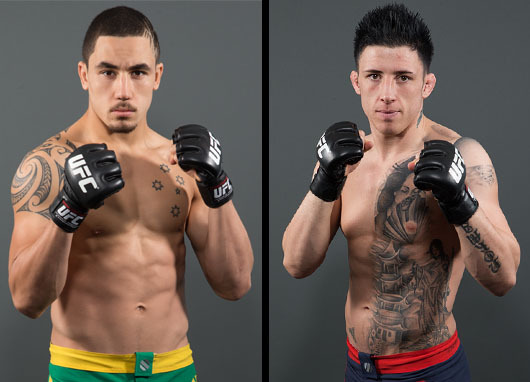 I think the early favorites this season have to be Justin Lawrence and Myles Jury. The most difficult aspect of shooting The Ultimate Fighter is the lack of light in the gym. The exposure during the fights is at least two full stops less than the typical exposure for pay-per-view events, which means I have to shoot at a much higher ISO than I would prefer and also a slower shutter speed. The end result tends to be less keepers and an overall decline in sharpness, as well as a higher amount of noise. Nonetheless, we still came up with some good shots. As the season continues, I will do my best to post regular blog updates. Below is a selection of my shots from the first episode. Be sure to check out the full take on Getty Images. Sorry for the late posting. I’m in Toronto now for UFC 140, which I’m covering for Getty Images and UFC. Last Saturday, I had the pleasure of shooting the live season finale for UFC’s reality show The Ultimate Fighter, Season 14. This season marked the first time the Featherweight (145 lbs) and Bantamweight (135 lbs) weight classes were showcased on the popular series, and the fighters did not disappoint. Many people who have followed my days of covering the World Extreme Cagefighting (WEC) know that I’m a huge fan of the lighter weight classes. On this night, they stole the show. The grudge match between season 14 coaches Michael Bisping and Jason “Mayhem” Miller turned out to be a one-sided squash in the main event. Mayhem tired after a very lackluster first round and proceeded to get pummeled for the next two rounds, finally being stopped in the third round due to unanswered knee strikes to the body on the ground. But, it was the two preceding fights, the Bantamweight and Featherweight finals, that were the real main events on the night. In the Bantamweight final, John Dodson defeated TJ Dillashaw by TKO in a quick bout. Some called it an early stoppage. From my vantage point, I thought Dillashaw was not defending himself intelligently after being dropped with a solid punch. The Featherweight final was surprisingly competitive. I think many people expected Diego Brandao to blow through Dennis Bermudez in much the same way Dodson did in his fight. However, Bermudez was not privy to that plan and came out guns blazing. 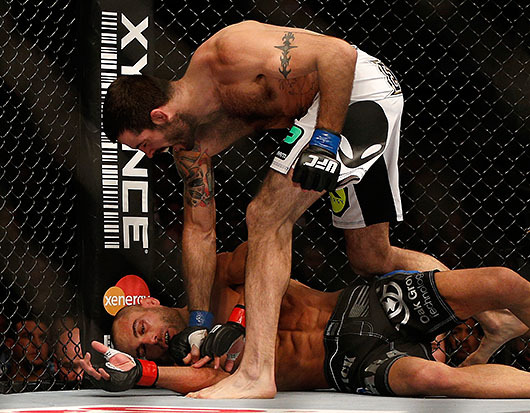 He landed a number of good shots standing against Brandao and ended up dropping him with a short right hand. Bermudez followed up with some good shots on the ground, but in an instant was caught in an arm bar and in mere seconds the fight was over with Brandao the victor. 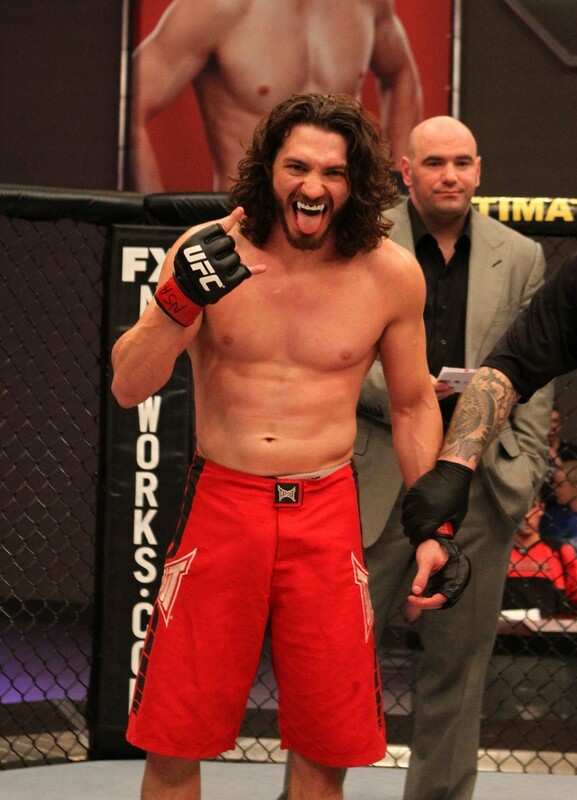 That earned Brandao the 6-figure contract plus two bonus paydays for Fight of the Night and Submission of the Night. As usual, the full take is available on Getty Images. Below are my favorite selections of the night.